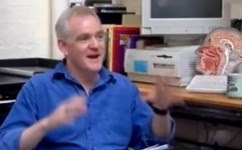 My former colleague Geoff Lindsey is a film maker and writer of screenplays and TV scripts. But now he is supplementing his income by offering his services as a dialect coach, along with accent reduction, English tuition and forensic analysis. Some of you may remember him from his days as a tutor on the UCL Summer Course in English Phonetics. In his c.v., for some reason, he keeps quiet about this part of his career, and about the fact that he not only got his BA in Linguistics from UCL but was also a lecturer in phonetics with us for several years. I’m happy to give him a bit of publicity in this new line of work, because on his website there is an excellent video clip in which he shows an Australian Hollywood lookalike how to sound American by changing just two words in her vocabulary. This is the sort of thing that is sadly lacking from my Accents of English. I am not sure it is really lacking from the books "Accents of English". Saying "uh uh" instead of "no", or "sure" instead of "yes" (or"sidewalk" instead of "pavement") is not really a feature of the accent, I would have thought. I wonder however if he uses the NURSE vowel when he says "sure"? Certainly it sounds very different from the British sure / shore / Shaw and it doesn't seem to be the CURE vowel, either. Is "sure" homophonous to "shore/shaw"? Damn, I've been using the CURE vowel, myself. But then again, I still have CURE in "your", "pour" and "poor". I learned the difference too late and find it hard to adopt consciously. In England (and in Eastern America, from what I understand) "sure" most frequently has the NORTH vowel, just like "shore" and "Shaw". But are you sure that you have the CURE vowel in "pour"? I take it you are from Central or Western U.S, but still it is supposed to be the FORCE vowel. P.S. please note that I am only an Italian native speaker, I am just going by what I understand from Professor Wells' books. In BrE and AustE, "sure" has the FORCE vowel /ɔː/ (which indeed makes it a homophone of "shore" and "Shaw"), or less commonly nowadays the CURE vowel /ʊə/. Both are fine for BrE-oriented EFL. Geoff is teaching this Australian woman to sound more American by (i) saying "sure" rather than "yes", and (ii) pronouncing "sure" with the AmE NURSE vowel, the characteristically AmE r-coloured /ɜ˞ː/. Oh, I'm pretty sure. I'm a Dane - I have far too many spelling pronunciations. Funny - now that I've had a chance to listen, it sounds a bit like an /y/ to me. Perhaps /yə/. I obviously have a tin ear. First, I agree with antoniodb70 that information on dialect and regionalisms shouldn't be considered "lacking" in Accents of English, which deals with accent, and not with dialect. "In England (and in Eastern America, from what I understand) "sure" most frequently has the NORTH vowel, just like "shore" and "Shaw"." Antonio, trying to pin down pronunciation in the eastern US doesn't work very well, because there are significant differences in accent between the northeast and the southeast even before you start subdividing into smaller regions. I would expect to hear something akin to "shore" (with the r pronounced) [ɔɚ, oɚ] or "shaw" (no r) [ɔː] in parts of the southeast, and "shaw" [ɔː, ɒ] in parts of the northeast. But in other parts of the northeast you would be much likelier to hear something like "shoor" (with or without the r) [uɚ, uɘ]. The version Geoff Lindsey was teaching, which has little vowel sound relative to its r sound, can be heard anywhere in the US, but is particularly identified with Southern California "Valley Girl/Surfer Dude" speech. John, in your notation [ɝː] do you mean the ː to refer to an extension of the r sound, and not of the [ɜ] preceding the r? Otherwise, I'd think something like [ɚ˞] might be a more accurate notation, even if it is very awkward, and possibly a crime against the IPA! When it comes to the CURE lexical set, it does seem to me that it has ceased to be a true set for most speakers of AmE, and of many speakers of BrE as well. I wonder if this is something you have observed as well, or if I am missing something important. I remember attending a computer scientist meeting in Germany. At a certain point, a native speaker of BrE said: “I am shore of that!”. Even with the clear context, some German participants were not sure ;-) of what they had heard and asked what he meant. He replied “I am sure” with the CURE vowel, which we all used. I don't know where he was from, but his native English was not exactly the language of that meeting. Daniel Jones reported the "shaw/shore" pronunciation in his first pronouncing dictionary (1917). So "shaw/shore" has been one of the pronunciations of "sure" in RP since the beginning of the 20th century, if not longer ago than that. Nowadays I would expect to hear the "shaw/shore" pronunciation of "sure" even more often in speakers of contemporary RP. I think the CURE pronunciation must now be a minority pronunciation, as "shaw/shore" may have been nearly 100 years ago. @Amy: all I meant by the symbol ɜ˞ː was a steadily r-coloured vowel, which is what I take to be the mainstream American NURSE vowel. On "sure", I report my BrE preference poll findings in LPD: 46% of my sample claimed to prefer "sure" as a homophone of "shore" (and 54% didn't). Personally I know I use both pronunciations inconsistently. Thank you, John. So my report on the dwindling occurence of the CURE diphthong in "sure" was - as we don't say in the US - "a bit previous." My copy of LPD3 is in NYC, and I am in Texas, or I could have looked this up for myself and saved you the trouble of correcting me! For me (rhotic American English native speaker, white, fifty, from just outside the NYC isogloss-bundle), there is a lexical split. The synonymous adverbs sure and surely (including the stand-alone uses meaning 'yes') have the NURSE vowel, but the adjective sure has the CURE vowel, which for me is /uɚ/. If I say Sure! 'yes' with CURE, it suggests to my ear a slightly different sense: 'of course', maybe a bit patronizingly. Interviewer: Your name, please, your name. Interviewer: David. Sure? [ʃɔː]David: Yes. Interviewer: (Writes) David . . . Shaw. David: No, no, David Thomas. Interviewer: (Gives David a long look, then picks up little bell and starts ringing it) Good night, ding-ding-ding-ding-ding-ding-ding-ding!